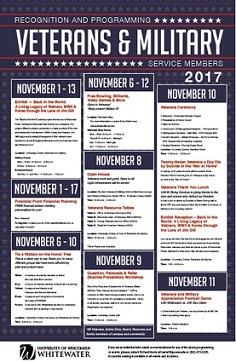 A number of events are planned on campus for Veterans Week, in honor of our veterans, military service members, and their family members. Nov. 1-13: “Back in the world: A living legacy of Vietnam, WWII & Korea through the lens of Jim Gill” exhibit in Roberta’s Art Gallery, UC (Gallery hours: M-TH 10am-6pm, F 10am-3pm, and special hours on Sat. Nov 4: 11am-1pm) – This exhibit is based on the three-hour “Wisconsin war stories” documentary from Wisconsin Public Television (WPT). There will be a reception for the exhibit from 1-2pm on Fri., Nov. 10, at which the photographer and producer of the documentary will talk about their experiences documenting Wisconsin veterans’ stories. Nov. 6-10 in the UC Commons: Tie a ribbon on a tree in honor of those who have served, or who are serving. Thurs., Nov. 9, 11am-12:30pm: “Question, Persuade, & Refer” (suicide prevention) workshop in UC 259. No registration required; open to the entire campus community. “Compared to their non-Veteran peers, most Veterans are at an increased risk for suicide,” and “[i]ncreases in suicide rates are particularly evident among female Veterans and Veterans who do not use VHA services.” For more information about the importance of working to prevent suicides among our veterans, please see the U.S. Dept. of Veterans Affairs’ National Suicide Data Report and state data sheets online. Fri., Nov. 10, 11am-12:30pm in the Hamilton Room, UC: Veterans Ceremony. Distinguished speaker will be Matt Bills (DAV Chapter #39), and the student speaker will be William Breyman. See also the Veterans History Project (Library of Congress, American Folklife Center), which collects, preserves, and makes accessible the personal accounts of American war veterans. Additional first-hand accounts of service in particular wars and conflicts may be submitted, either recorded materials (audio or video) or print items (diaries, letters, photos, etc.) – see the guidelines. If you’d like assistance with finding additional information, please ask a librarian (choose chat or email, phone 262-472-1032, or visit the Reference Desk). Andersen Library is a federal depository library with federal government documents on a variety of current and relevant issues available to you in various formats (print, DVD/CD-ROM, online). Check out your government at Andersen Library! This entry was posted in campus connection, info.gov and tagged ceremonies, federal government, government info, lectures, military, training, veterans. Bookmark the permalink.